It's a great alternative to boring, plain pancakes on a busy morning and using pre-made mix makes it so easy and fast. All you have to do is thaw one of the frozen bananas, mash it and mix it right in! It's so easy to add a little more flavor to most things with a little imagination! 2. Combine pancake mix, water and brown sugar in a bowl. 3. Add banana and stir. Be careful not to over-mix. 4. 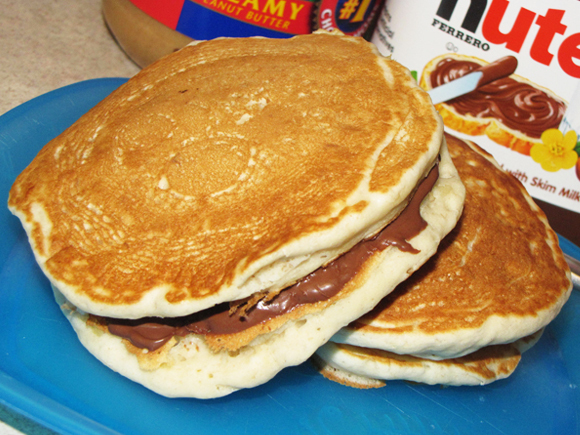 Cook pancakes according to mix directions. 1. Add about 1/4 c chopped nuts to the batter before cooking. 2. Add about 1/4 c chocolate chips to the batter before cooking.